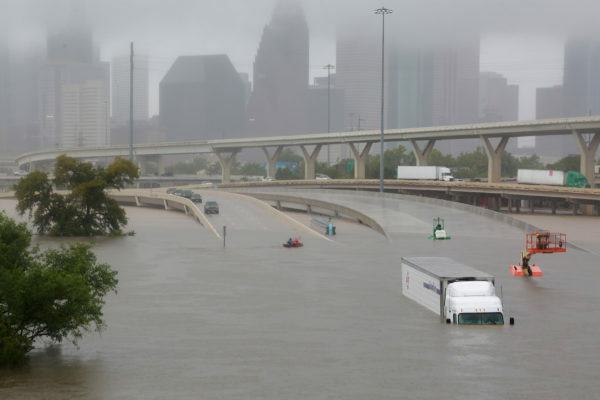 Interstate 45 is submerged from the effects of Hurricane Harvey seen during widespread flooding in Houston, Texas, Aug. 27, 2017. 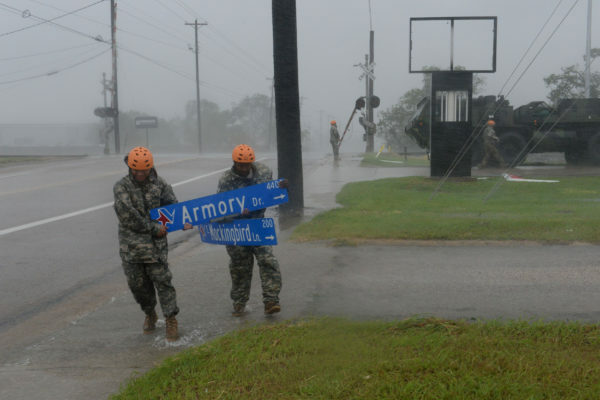 Texas Guardsmen from the 386th Engineer Battalion pick up large debris following Hurricane Harvey in Victoria, Texas, Aug. 26, 2017. 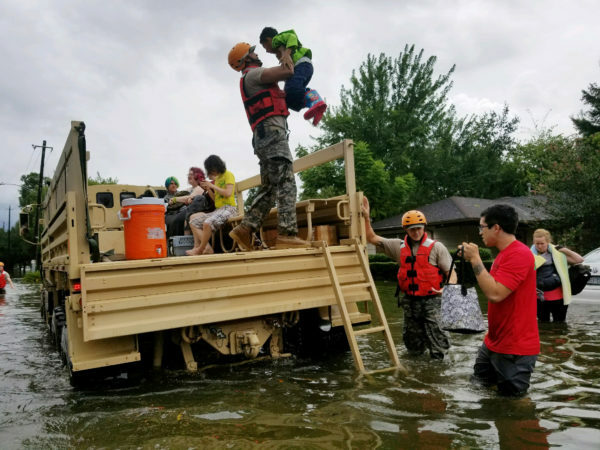 Texas National Guard soldiers aid residents in heavily flooded areas from the storms of Hurricane Harvey in Houston, Texas, Aug. 27, 2017. Maine transplants who safely rode out Hurricane Harvey on Friday when it slammed into the Texas coast were fretting Sunday afternoon about the rising floodwaters. Christa Clarkson, formerly Cherryville, said that on Saturday the winds at the RV park in Austin where she lives and works year-round reached 70 mph, and that the rain came down so hard at times it created whiteout conditions. The rain was still coming down hard on Sunday. Clarkson said the lake at the RV park was already 6 feet above flood stage. Harvey, which hit the coast on Friday night as a Category 4 hurricane but was downgraded to a tropical storm on Saturday, has stalled over southeast Texas and is dumping rain that is being measured in feet, not inches. Forecasters are warning of epic flooding and that rain could continue until Wednesday. Five volunteers from the American Red Cross of Maine were all expected to be in Texas by the end of Sunday to begin doing whatever they can to help, spokeswoman Ann Kim said Sunday. Hampden resident Darlene Helms is among them. She arrived in Texas on Friday and helped set up a shelter in Galveston on Saturday, but found herself stranded with three other Red Cross volunteers — and about 200 other people — when the hotel the Red Cross group took refuge in later that day in Sugar Land flooded on Sunday morning. Helms said her group was on its way to set up a shelter in Galveston when flooding forced them to get off the highway in Sugar Land. The weather “just deteriorated. The rain just hit so fast,” she said. When the group woke up Sunday morning, a foot of water had flooded their hotel’s first floor and the water in the parking lot was waist-high, stranding them, the hotel staff and roughly 200 others, many of them evacuees from Corpus Christi who were trying to make their way back to their homes. To make matters worse, the flooding inside the hotel put its kitchen out of commission, said Helms, who has been deployed by the Red Cross nine times before, though usually as a caseworker in the aftermath of disasters. While the hotel’s management had planned ahead and brought in lots of food and water, they did not anticipate the flooding. Not only could the food on hand not be prepared, the bottled water couldn’t be used for fear of contamination from the floodwaters. “Looking out my window, we can see the Olive Garden and a place called Saltgrass [Steak House] on the other side of us, but we can’t do anything because nothing’s open and you’d have to go through waist-deep water to get there,” Helms said. Because Red Cross volunteers aren’t the type to sit around when there are people in need of help, the four jumped into action, she said. So they offered their services to the hotel’s management. “We knew people would come to us because we have the Red Cross [symbol] on, so they know we’re reliable,” she said. “It was amazing how it worked out for the best,” she said. As of early Sunday evening, plans were being made to evacuate the hotel. Once that happens, however, the evacuees will only be able to bring backpacks with them, meaning luggage will have to be left behind. Helms, however, was taking that in stride. Meanwhile, Ryan Emery, a former Gorham resident now living in Kingsville, Texas, also was hunkered down at home when Harvey hit. While he prepared his family for the worst, the hurricane didn’t hit his community — which is about 70 miles south of where Harvey made landfall near Corpus Christi — as hard as many had feared. “We actually got very lucky,” said Emery, who served in the Navy from 2003 to 2010 and now is a Navy reservist employed by the Department of Defense. Presque Isle native Shawn Bryant, a concrete-form carpenter who moved to Victoria, Texas, two months ago, also made it through the hurricane unscathed. He stayed in his home despite a mandatory evacuation order. Bryant said Saturday that the storm had knocked trees down onto vehicles and buildings, had blown off the front of a small business and part of a neighbor’s roof, and knocked over gas pumps. Christine Morin, formerly of Princeton, is better known as Tina Neptune back in Maine. Morin said Friday that she, her husband and their teenage son planned to stay in the camper they are living in while traveling around the country to her husband’s construction jobs. On Sunday, Morin said everyone was OK, but that the rain continued to pour down. Red Cross of Maine spokeswoman Ann Kim said Mainers who want to help with the relief effort can do so by visiting the Red Cross’s website at redcross.org, calling 800-REDCROSS or texting the word HARVEY to 90999 to make a $10 donation.